In the wake of Erin Griffith’s piece in the NY Times suggesting that venture capital is toxic for some entrepreneurs, there has been a fair bit of debate about the causes of that situation. It is tempting to look at what is going on in the startup/tech landscape and say that the growing amount of capital under management is the problem. But the capital market for startups is a complex system and I don’t think it is as simple as that. It may well be that as entrepreneurs have had more negotiating leverage over the last twenty+ years, they have pushed valuations up significantly and the capital markets (ie VCs) have reacted to that by accumulating more capital so that they can try to buy the same amount of ownership at the higher prices. That hasn’t really worked and the VC industry typically owns a lot less of a company at exit and the founders and team own a lot more versus 25 years ago. We have seen that clearly in our own portfolios over the last fifteen years and I would assume that is true across the industry. So while it is tempting to suggest that big bad VCs are the reason for all the problems in the startup sector, I would caution everyone from coming to that conclusion. Like all relationships, it takes two to tango, and both sides have had something to do with where we are right now. I listened to this 40min interview of Marc and Ben earlier this week. I enjoyed it. Marc and Ben are smart and witty and know how to work off each other. I got a few really good laughs too, which is always a bonus with these things. A friend sent me this Kickstarter project earlier this week. I took a look and thought “wow, that’s so great. a digital piggybank for kids with its own cryptocurrency, a mobile app, and educational games teaching them to earn and save.” I backed it this morning and though I don’t normally take the rewards on Kickstarter, I did this time. I can’t wait to give this to a kid when I get it this summer. For most companies and projects in the crypto sector, a big issue has been how to design their token and how to get it in the hands of users, validators/miners, and investors. As Joel explained in this post, you need all three stakeholders to create a well functioning crypto-token. There is the Bitcoin approach, which is to allow anyone to mine the protocol and earn tokens. There is the Ethereum approach, which is to do a pre-sale. And there are many other approaches. The last time I looked there were over 2,000 crypto-tokens that are trading on various exchanges around the world and many more that are not yet trading. There are plenty of considerations when you design a crypto-token but certainly one of them is figuring out how to avoid having it deemed to be a security in the US. Securities are highly regulated in the US, can only be traded on regulated exchanges, come with significant disclosure requirements (many of which make no sense for an open source project), and there are limits to whom you can sell them to and how. So when William Hinman, director of the SEC’s Division of Corporation Finance gave a speech at the Yahoo Finance All Markets Summit on June 14, 2018 suggesting that Bitcoin and Ethereum were not securities and laid out an argument that they were sufficiently decentralized, it got a lot of people’s attention in the crypto sector. The basic reasoning behind the decentralization framework is that if a project is truly decentralized and there is no central actor or actors, then there really is no “issuer” and there is no possibility that the central actor(s) can act on insider information or otherwise have information asymmetry. The crypto industry has been pressing the SEC to codify this logic in a set of rules that projects and companies can follow. But the SEC has to date been unwilling to do so. So the Blockchain Association has stepped in and taken a stab at codifying the Hinman Test. In a post they published today, they have laid out the basic arguments of Hinman’s Framework and then outlined how one could determine if a token project was sufficiently decentralized. This is not as helpful as an SEC published set of guidelines, but until we get that (soon I hope), this will have to suffice. Those are the two words that come to mind when I looked at the Q4 2018 PWC/CB Insights Money Tree Report. 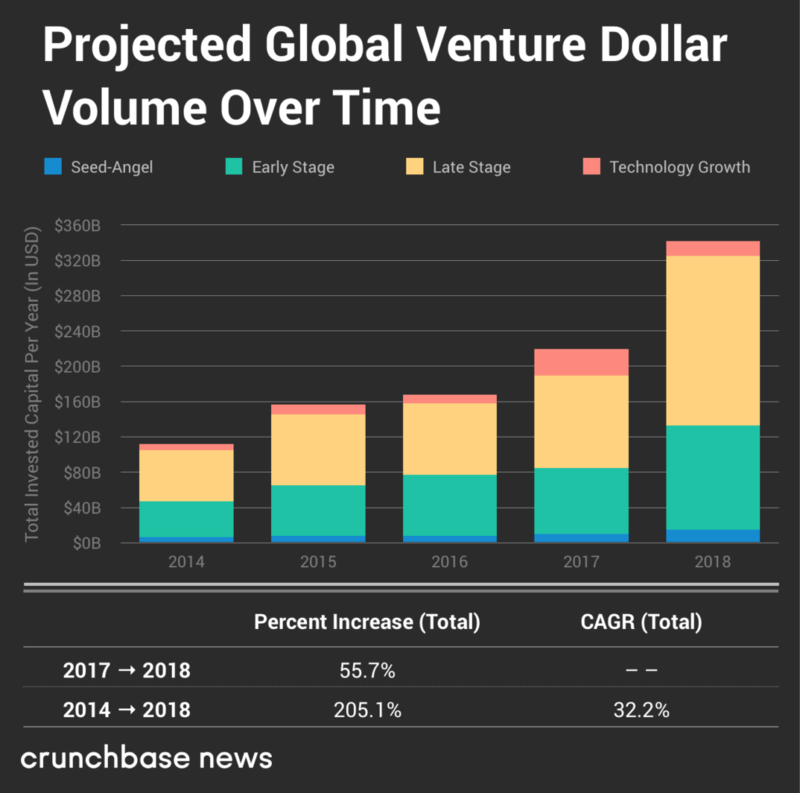 2018 saw the venture capital business moving to larger and larger deals. There were roughly 200 deals around the globe in 2018 where $100mm or more was raised. And yet the number of total transactions declined slightly from 2017. This trend is much more obvious if you look at the six years from 2013 to 2018. Total deal activity has increased less than 10% while total capital investment has almost tripled. These trends are unsustainable. It is certainly attractive to de-risk by moving upstream to invest in more mature companies, larger rounds, etc. But if we don’t reseed our fields there won’t be as many of those mature companies in the future. And that is why USV remains a small fund/firm which allows us to invest in Seed, Srs A, and Srs B rounds. It may not be fashionable to do that right now, but I am certain that it is and will continue to be profitable. That is the installed base of iOS phones vs Android phones globally over the last decade. I have been a long and loud fan of Android’s open (or at least more open) model and an equally long and loud detractor of Apple’s closed model. I’ve taken a lot of heat and ridicule for it over the years and still do. But to me, there is no way to win long term with a closed model. It is a lot like The Tortoise and The Hare. Closed allows you to build a better user experience and get out of the gate quickly. Open takes longer, the user experience is poor initially and for quite a while, but when open gets going, it is unstoppable. The Gotham Gal and I went through our (actually her) angel investments yesterday and figured out which ones went under in 2018 so we could take the tax write-offs on our 2018 returns. It is an odd exercise. Kind of like reading the obituaries. But it is an important exercise for several reasons. First, taking the write-offs against the gains shelters the gains so they can be re-invested in full. Over her first six years of investing (2007-2012), she has realized a bit more than she invested and the losses have sheltered the gains so all of that capital can be reinvested. And the investments that remain unrealized from that cohort are all solid now and will likely produce another 2-3x on invested capital. But it also a nice “post mortem” process to go through the ones that didn’t work and think a bit about what went wrong. We don’t obsess about the losses, but taking some time to run through them is helpful. Sometimes failed investments turn into the “living dead” in which you end up a tiny investor in another company by virtue of an acqui-hire, a distressed sale, or some other such transaction. It is generally a smart idea to sell your stock back to the company or another shareholder or abandon your interest and take the loss on those kinds of investments. The tax loss is often worth more than the stock you own. A regular process of going through the losses will surface opportunities like that too. The bottom line is that angel investing is risky business. Super early stage investing, like the kind the Gotham Gal does (she is most often the first check into the company), will produce loss ratios of 50% or higher. The winners eventually bail you out and super early stage investing ought to produce 3x on capital or better (or you shouldn’t be doing it). One nice advantage of this model is the losses come early and the wins come much later. Taking your losses, getting the write-offs, and sheltering your gains is an important part of the model and it is best to have a regular process to make sure you are taking the losses when you can. Joel Monegro, who is one of the Partners at Placeholder and a former USV analyst, has written an important post that outlines the relationships between the three primary stakeholders in a cryptonetwork; users, miners/validators, and investors. Flip is a USV portfolio company. They provide a suite of services to renters that allow them to easily flip out of leases and move when they need to with the cooperation of landlords. Before Flip was a USV portfolio company, it was angel funded by the Gotham Gal and Flip’s founder Susannah Vila went on the Gotham Gal’s podcast last month to talk about how she got the idea to start Flip and how she has gone about building the company. It is a great listen. I saw this project this morning and backed it instantly. It checks a lot of boxes for me.